Type 1 diabetes is also known as Teen diabetes, Insulin-dependant diabetes mellitus (IDDM), Juvenile or Childhood diabetes. This type of diabetes usually occurs in children and young adults. If you are diagnosed with this kind of diabetes than you need to understand what it is and how it works. Type 1 diabetes means that your pancreas (a small organ behind the liver) has "hung up it's hat." In other words, it's pretty much dead, retired, deceased! But not all the time is this the case. Some people have type one diabetes and still have a pancreas that puts out a little bit of insulin from time to time. However, their pancreas eventually dies. I read about this picture and how it works in the "Pink Panther" book called "Understanding Diabetes," and thought it might be helpful. I re-created the picture and added a cute little cartoon to give it more life and color. This picture shows what the production would look like in a normal person. The liver produces sugar that then flows into the blood stream, hence the name "blood sugar." The pancreas (which you cannot see in the picture) produces and secretes insulin also into the blood stream. The insulin blocks the sugar production at the liver so that the blood cells don't get over populated with sugar. 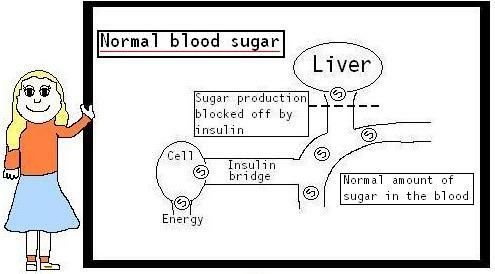 As the insulin and sugar then travel along the insulin bridge, it feeds a cell and gives us energy. Look at the picture below to see what a diabetic's production looks like. This picture shows how it would be in a person with type 1 diabetes. The insulin production and secretion has stopped therefore leaving the liver open to keep making and passing on sugar into the blood stream, then becoming over populated. 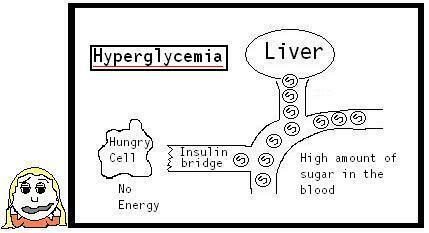 As you can see the "insulin bridge" is severed and there is a very hungry cell waiting for energy. That is why most people who are thought to have type 1 diabetes are always tired. Also when a diabetic has a high blood sugar (too much sugar in the blood) than he/she is also tired. Now if you don't already know, a normal pancreas secretes little bits of insulin all day long to help the intestine break down the food and make it into energy. Usually within the first few months with a broken pancreas your body could go through what's called a "honyemoon period." This causes your pancreas to "wake up" so to speak and start functioning again. However, after a while your pancreas quits and doesn't start working again. This could last as long as a year or two. CAUTION!Don't think that you're saved and you don't have type 1 diabetes anymore. I know it might be wonderful to think that you are healed but make sure you talk to your doctor about this just to make sure. It may save your life! Okay, where was I, Oh yeh, explaining the function of the pancreas. Well, as I said, a normal pancreas puts off tiny bits of insulin all throughout the day making your blood sugars normal. When you eat, your pancreas is notified by your brain and so then goes to work producing more insulin. Every time you eat (just like dosing for a meal) your pancreas has to put off more insulin than if you were just sitting, reading a book. If you're exercising, than once again your brain notifies your pancreas and says, "you can take a break now. In fact, just ease up on the insulin for a bit until this person stops exercising." If you get too much insulin when you are exercising, then your blood sugar will be low. For a person with a working pancreas, if they wait too long to eat after exercising then they might start to get shaky, hungry, weak and get a headache, just like a diabetic having a low blood sugar! 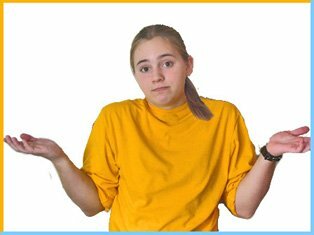 the difference between the two (other than having a broken pancreas or not) is that a diabetic's blood sugar will not stop going down unless they do something about it, and a non-diabetic will just be uncomfortable if they do not do something about it. Well, I think I described how the pancreas works pretty well anyway. If you have any further questions and can't find it in any of my other pages check out my contact me page and you can shoot me an email. I usually check my emails everyday and respond promptly (depending on how many emails I have), so there you have it.